We're inside the building and waiting to jump into our seats. Stay tuned for all the live coverage you could possibly want (or need)! 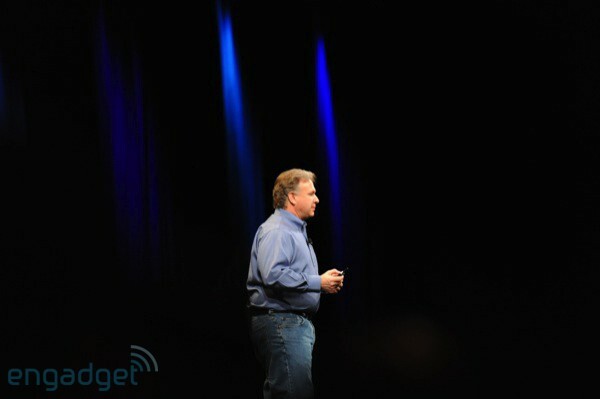 10:34AM Well that's it folks -- no Steve, no iPhone nano, no new Mini, no new iMac, no shockers, no surprises. 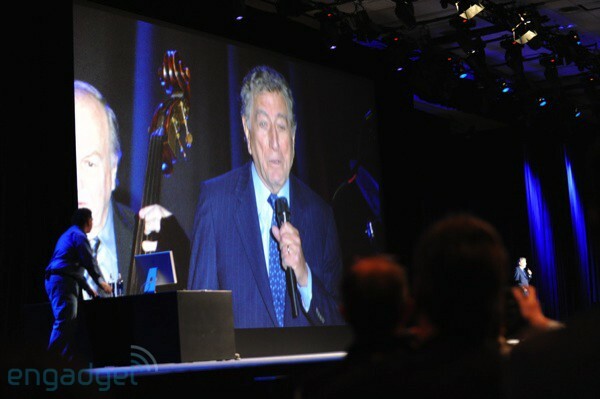 We're off to the floor... but hey, Tony Bennett is incredibly smooth. And that's something, right? 10:31AM Man Tony sounds good! 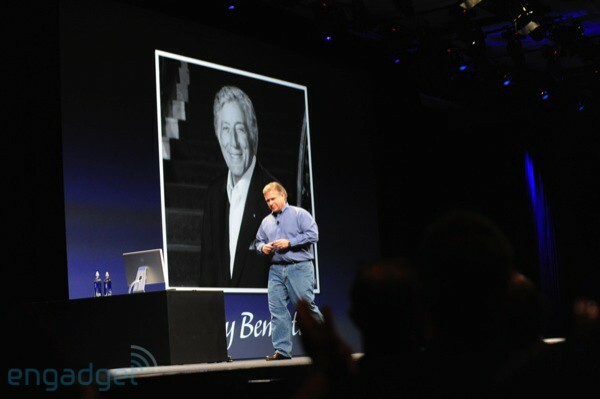 10:31AM "With no more fanfare... Mr. Tony Bennett." Wow! Sweet! 10:31AM "Now we're ending on music -- we always try to remember why we do this. 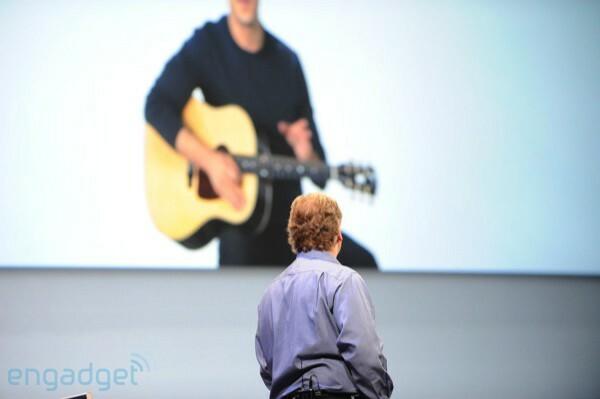 We love great music, that's the heart of it, so I think it's fitting that we end our last Macworld keynote with an amazing artist and legend..."
10:30AM "It's the same quality you get in the store, right on your phone, no matter where you are, and you can sync back to your computer. That starts today." 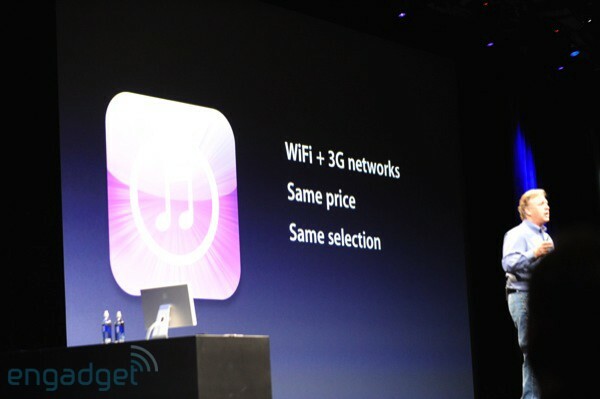 10:29AM "The music store is no longer just on WiFi -- it's over 3G as well." 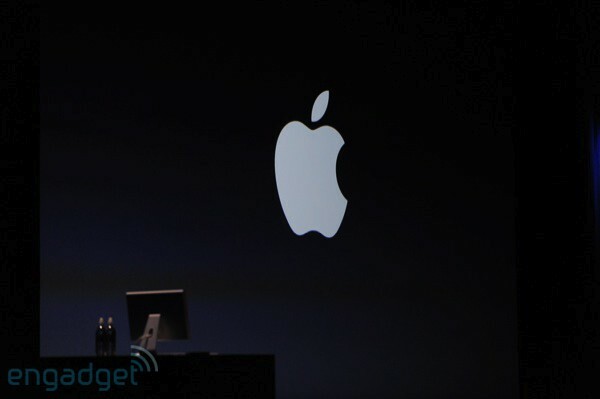 10:28AM "The third new thing happening with iTunes has to do with the iPhone." 10:28AM Ha! 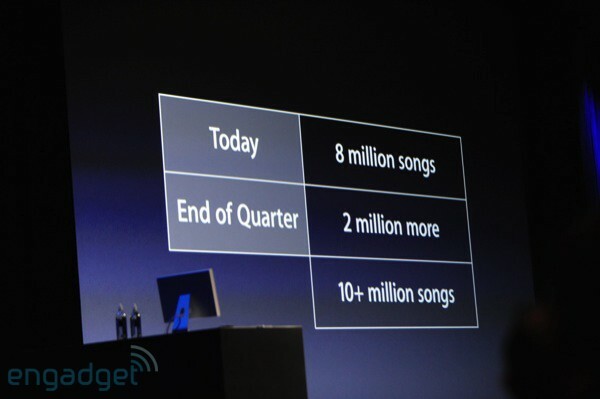 "All songs DRM-free"
10:28AM "By the end of this quarter, all 10 million songs will be DRM free." About time! 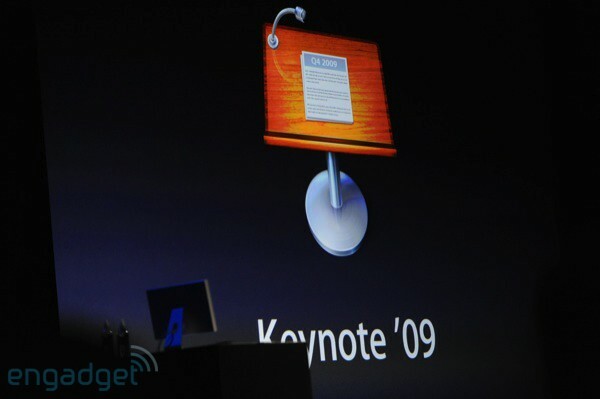 10:27AM "Next, iTunes Plus -- it's DRM free, and much higher quality. 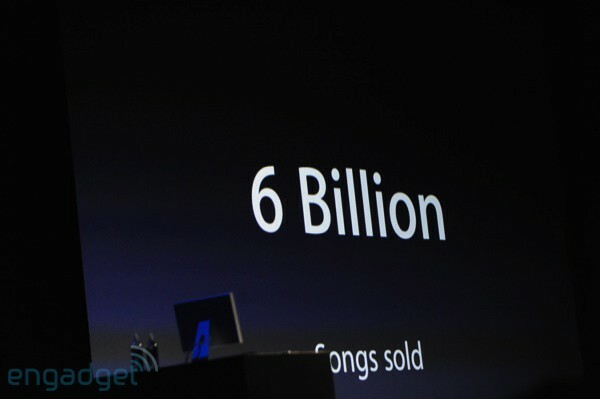 We've worked with all the major companies... starting today, 8 million songs will be DRM free." Huge cheers. 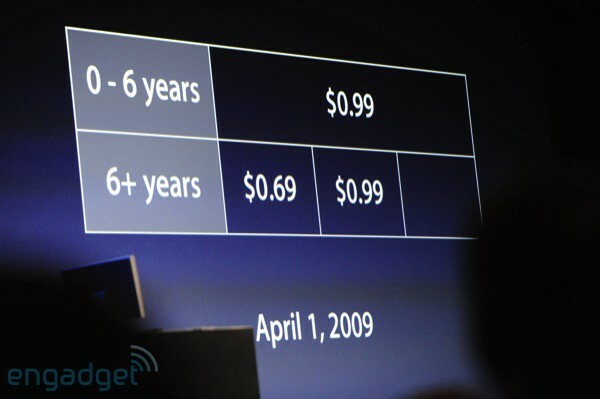 10:26AM "Over the last six years songs have been $0.99 -- music companies want more flexibility. New pricing, $0.69, and another tier at $1.29." 10:26AM "I'd like to tell you about three things... first... price." 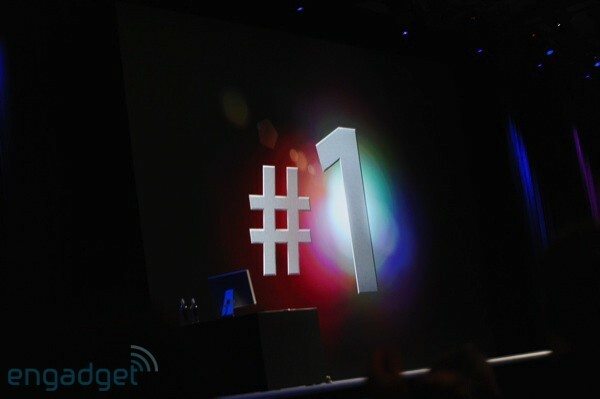 10:25AM "It's great to see how many people want to buy music like this -- iTunes became the number one channel for music in the US. 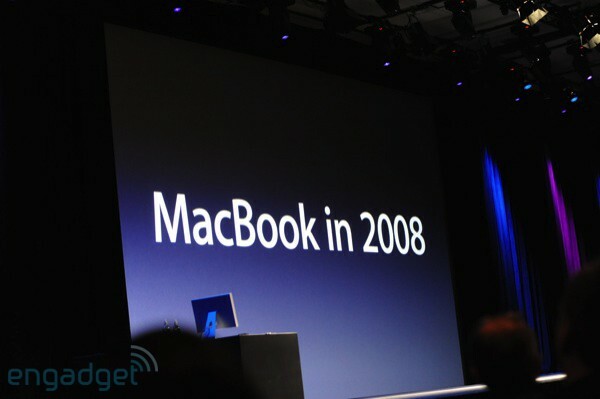 So what's new in 2009?" 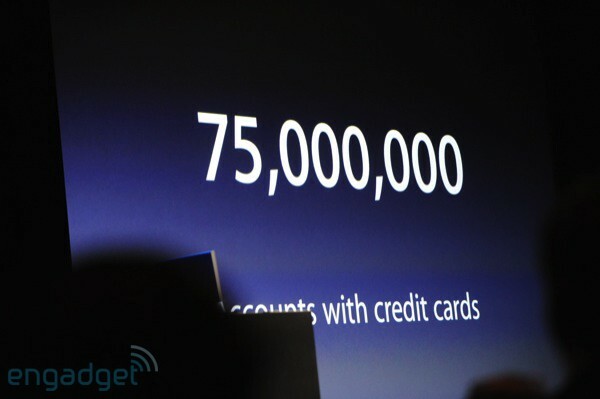 10:25AM "We've sold 6 billion songs... and iTunes is the world's largest media library... and we now have 75 million accounts with credit cards." 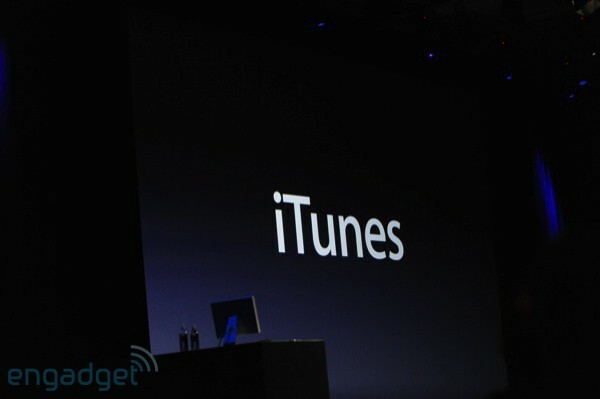 10:24AM It's about iTunes -- I think we know what this is! 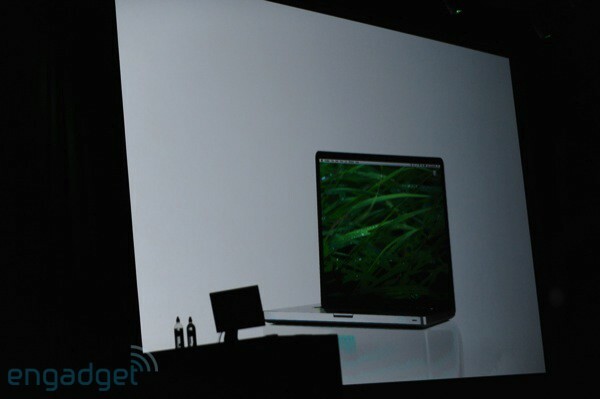 10:24AM "We do have one last thing in this keynote..."
10:24AM "Here's our ad..." "This is the new 17-inc MacBook Pro..." Oh, we can't do this beauty justice, but it's harping on the green aspect of the laptop. 10:23AM "If you need to exchange it, we have a program." 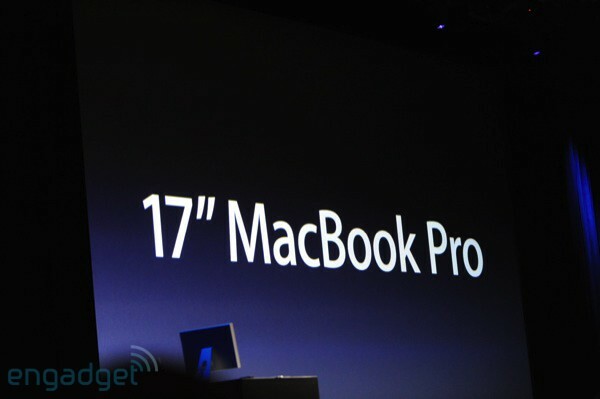 "It comes in one config -- $2799." 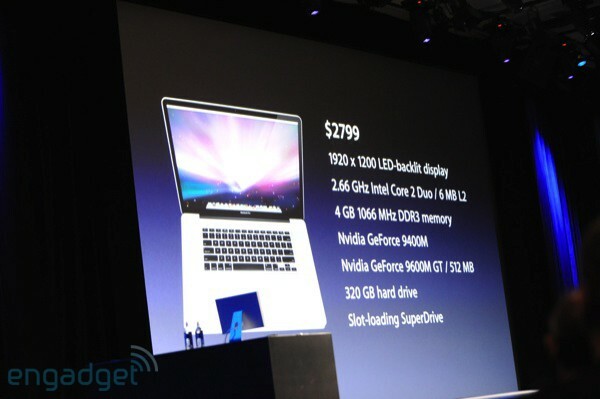 2.66GHz, 4GB RAM, 320GB hard drive... it starts shipping at the end of this month. 10:21AM "What does it mean for all of us? 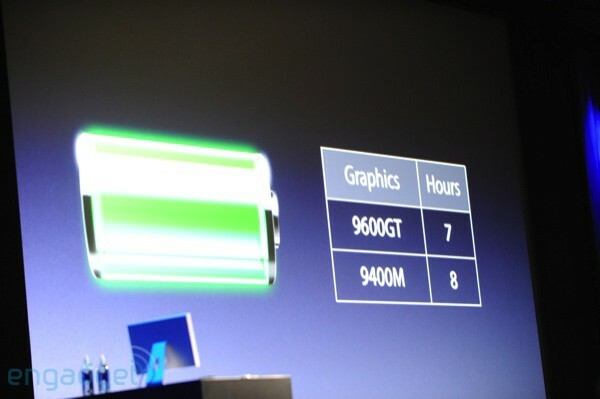 Incredible battery life -- discrete graphics, up to 7 hours, integrated chip, 8 hours." 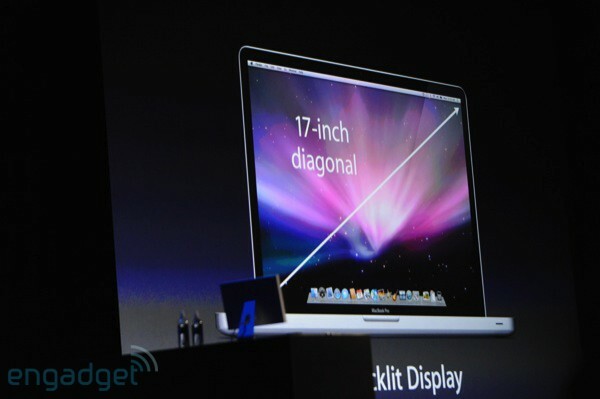 10:21AM "So that's the battery in the new 17-inch." 10:20AM Now they're documenting the eco-friendly nature of the battery. 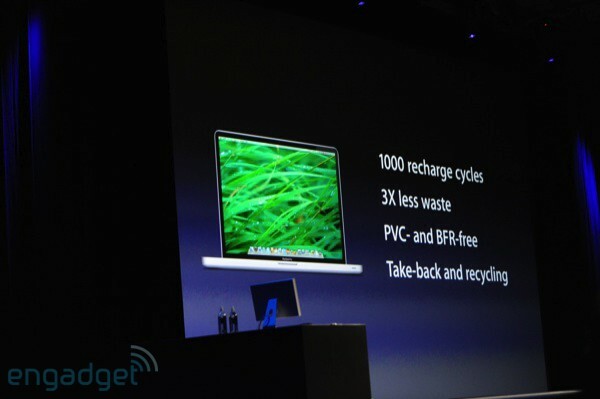 Battery life is longer, less batteries in landfills. 10:19AM "We get up to 1000 recharges... we have a chip in the battery that talks to each cell, and the system adjusts the current accordingly. 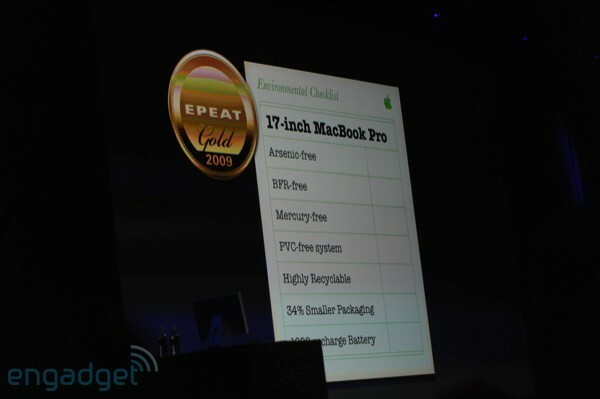 3x the charges and lifespan of the industry standard." 10:18AM This is pretty technical -- documenting the construction of the battery. 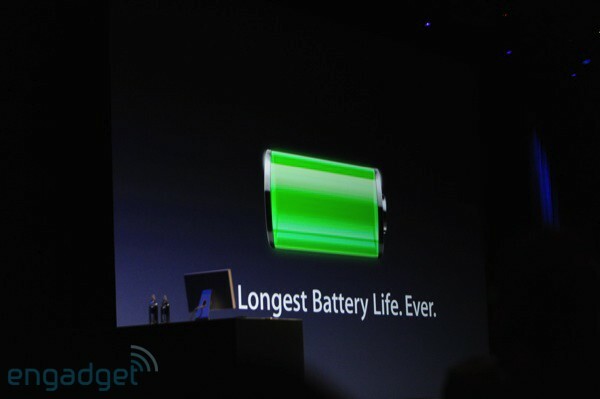 Let's put it this way, it makes all other batteries cower in fear. 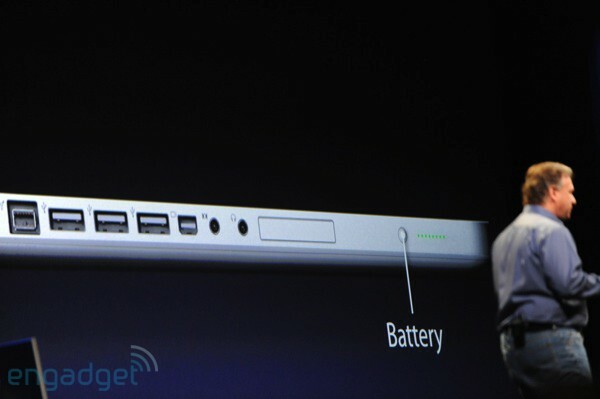 10:18AM "We created a 40 percent larger battery, with the same weight..." "We can build custom batteries." "Our competition uses cylindrical cells... we've created custom shapes for our cells." 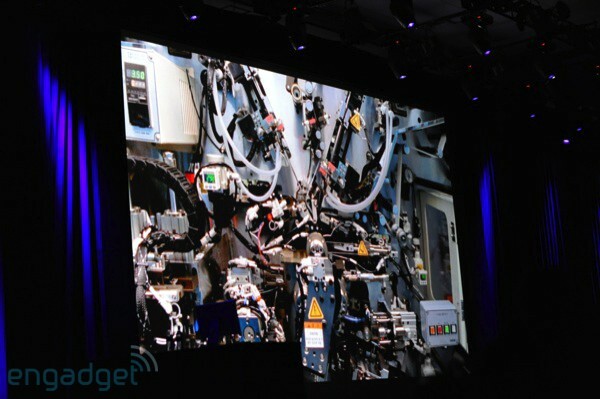 "To make our batteries thin we use lithium polymer tech... it expends the life to 3x the industry standard." 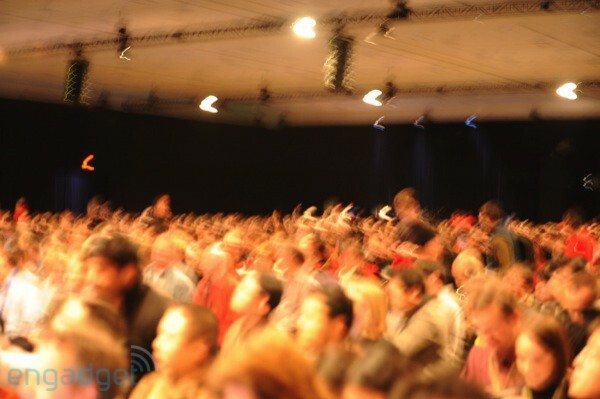 10:17AM "We've designed a battery that will last 8 hours on a charge, and can be charged 1000 times..." "The key to building a longer battery is making it bigger... the challenge is where to find the space to put it... in a removable battery there's a lot of wasted space." 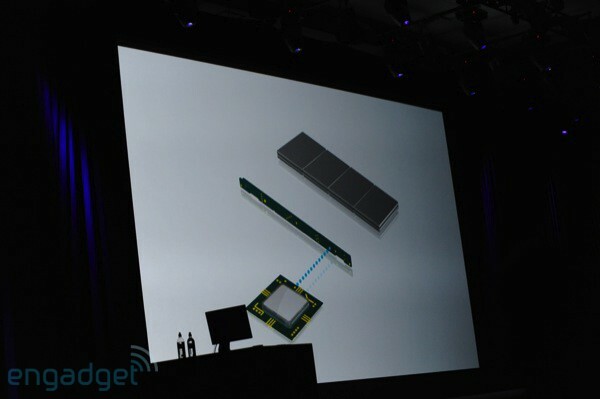 10:16AM "We wanted to deliver our longest lasting battery ever, but we wanted to keep it thin and light..." It's obviously not removable... now a video on the tech. 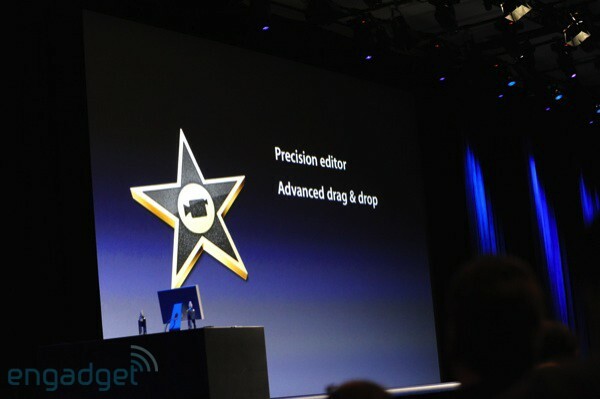 10:15AM "I haven't talked about one feature. 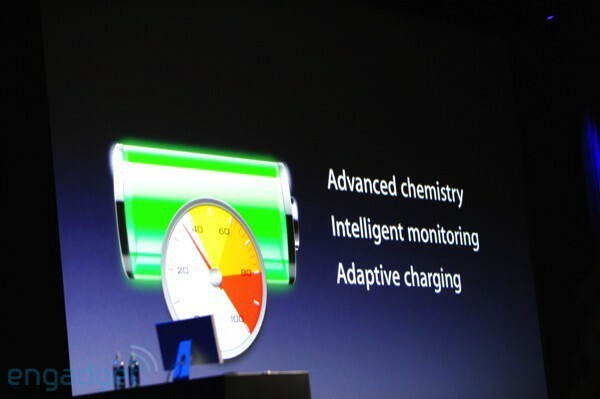 The battery." 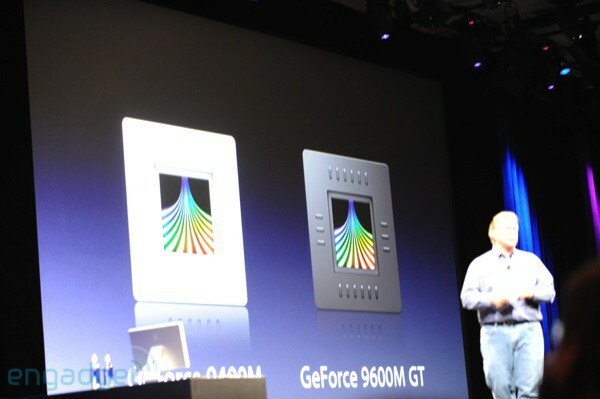 10:15AM "Inside we have a new generation of C2D CPUs -- up to 8GB of RAM... new NVIDIA graphics options, discrete graphics onboard." "You can upgrade to a 256GB SDD." 10:14AM Showing off the i/o -- Same as the other Pros. 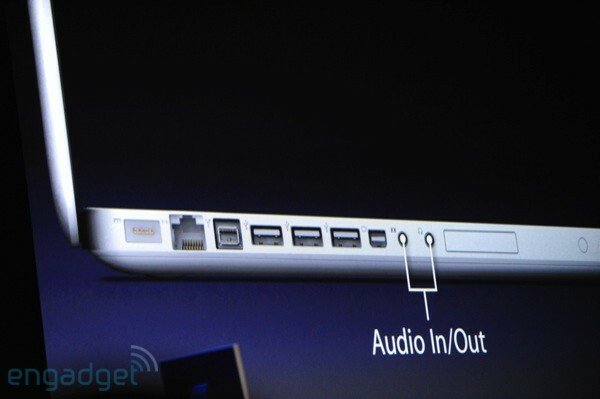 Mini DisplayPort, USB, FireWire 800, MagSafe... and it's got the glass trackpad. Didn't think they were going to go back on that one. 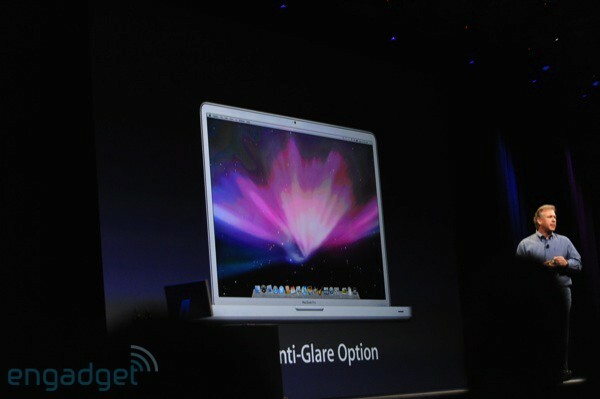 10:13AM A $50 anti-glare option will be available for the laptop. 10:13AM Whoa! 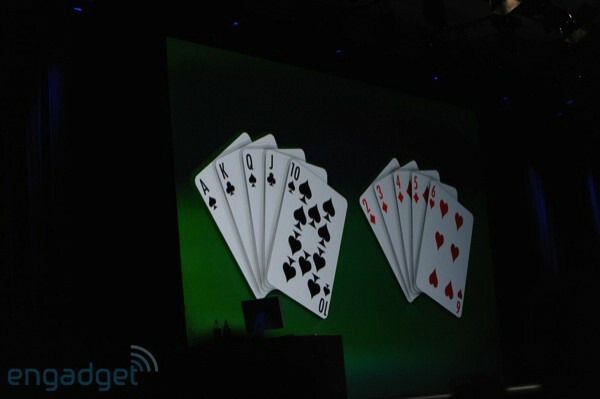 A matte display! 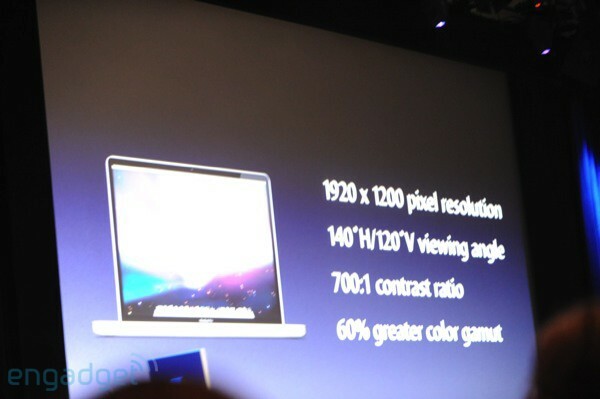 10:12AM "1920 x 1200 display, 700:1 contrast ratio, 60% greater color gamut." 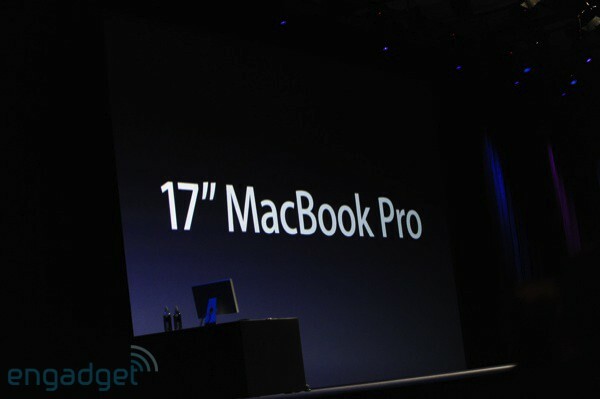 10:12AM "I'm proud to show you the new 17 inch MacBook Pro -- it's the world's lightest and thinnest 17 inch notebook." 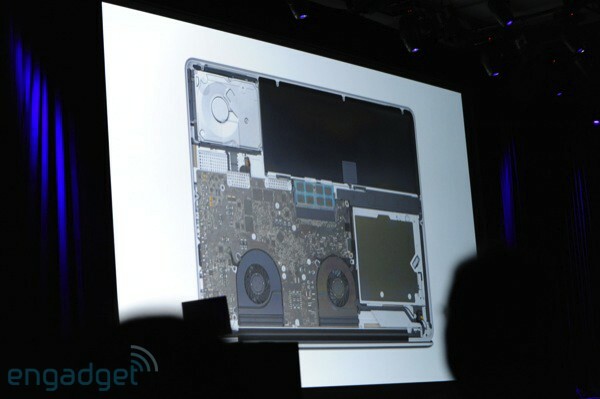 10:12AM "We came up with a better way to make a notebook, people really love them..." He's quoting some mainstream critics -- wow! 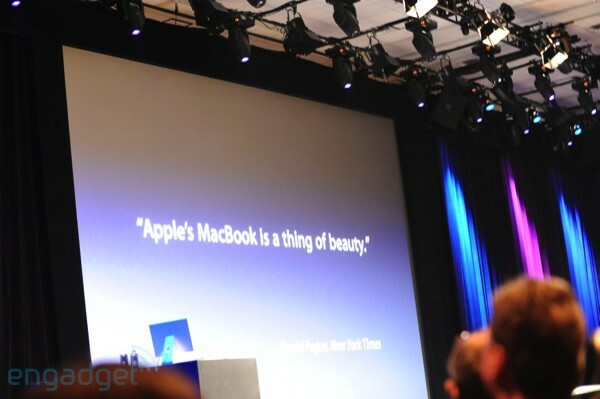 "If you look at a list at all the notebook products sold in the States, MacBooks have been number one..."
10:10AM "It's the new 17-inch MacBook Pro." 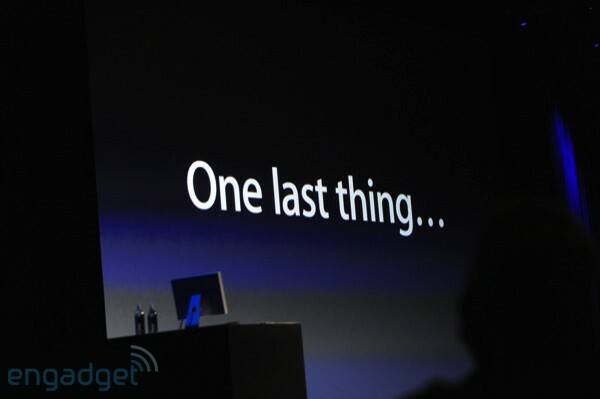 10:10AM "One more thing... the third thing." 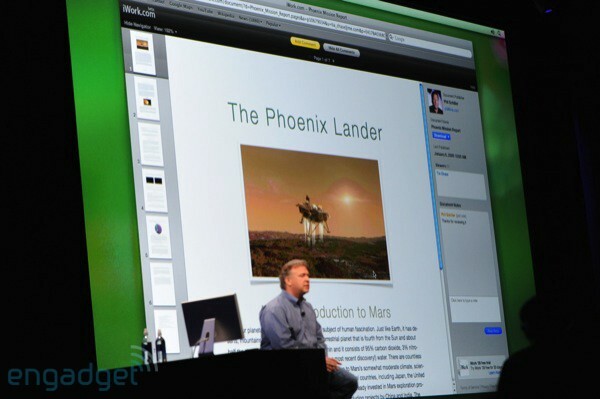 10:09AM "Here's a Keynote presentation, shared on iWork.com... that's what it's like using iWork.com." Nice applause. "Now this is the beginning of a new service, customers can sign up free for the beta... eventually it will be a pay service." 10:08AM "There's a new item that says 'show shared document' -- it will show all the documents that I'm sharing, and who I'm sharing with. I get notice that there's a new note that I need to read... I can reply right in the doc." 10:07AM You can add notes, edit... just like Google Docs. Someone, somewhere is very unhappy. 10:07AM "She sees the document in the browser -- it looks like Pages, but I'm on iWork.com." It does look exact, very nice. 10:06AM "So I'm going to send this and click share -- Pages is sending them up to iWork.com -- okay, it's up there, and that's it." "So what's it like on the viewing side? I'm going to switch computers... next time "Tia" is in her email, she'll see this message 'view this document', and that launches her browser -- this can be a Mac or a PC." 10:05AM "I've been working on this document, but I want to get feedback on it. I use iWork.com, there's a button up top here that says iWork.com -- just type in the email address you want to share with it, it pulls from address book..."
10:04AM Ha, beta, just like Google! Okay, demo time. 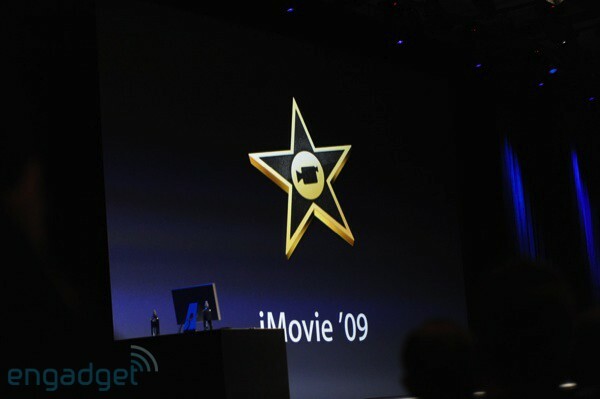 10:03AM "There's one more thing we want to talk about: iWork.com. We're going to announce a beta so we can get feedback." Ooh. Watch out Google. 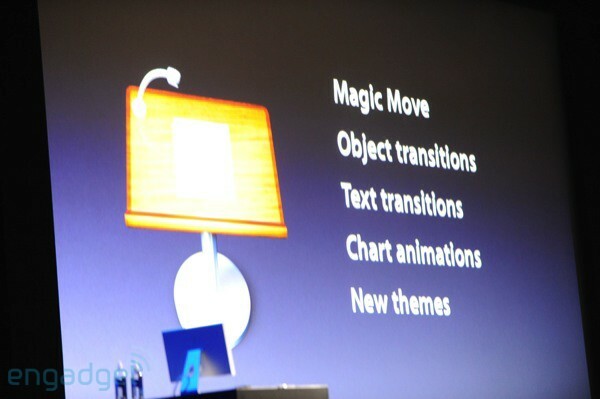 This is Google Docs, but by Apple. 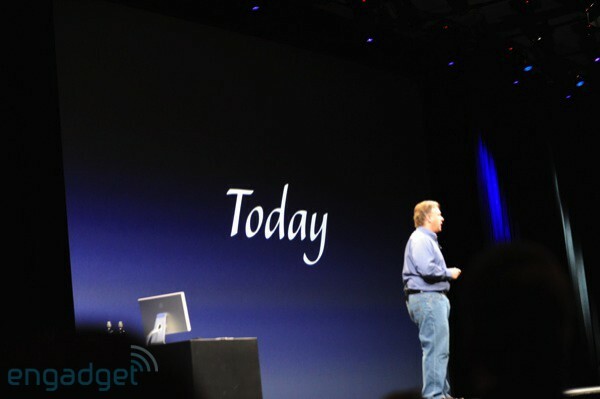 10:03AM "Leopard is needed for the new iLife, we've got a new product called the Mac Box Set, Leopard, iLife, and iWork for $169." 10:02AM "So that's iWork. 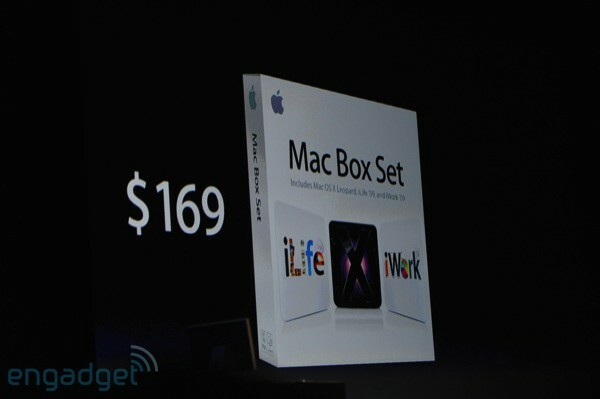 $79 for single user, $99 for the family pack, and $49 with a new Mac. 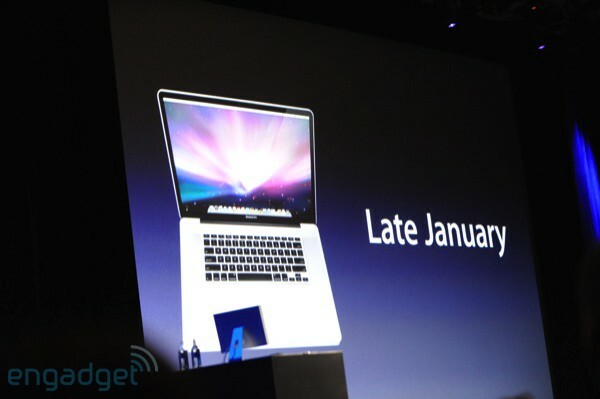 It starts shipping today." 10:01AM New Numbers features... so, did you guys do anything cool over the weekend? 9:58AM He's just run through a slew of Pages templates... next up... Numbers. 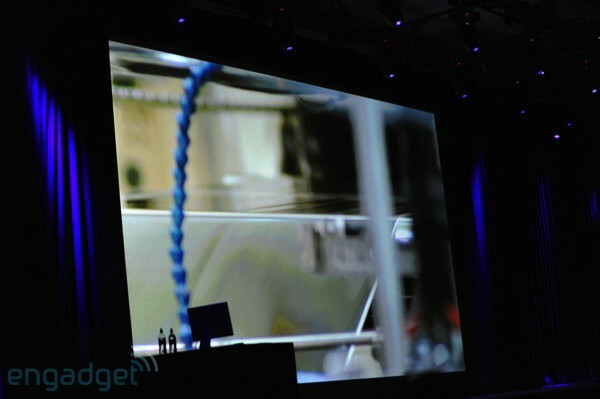 9:57AM We get the sense that Phil is building to something here, and we recognize that these products are getting really sweet updates... but we'd love to see some hardware. 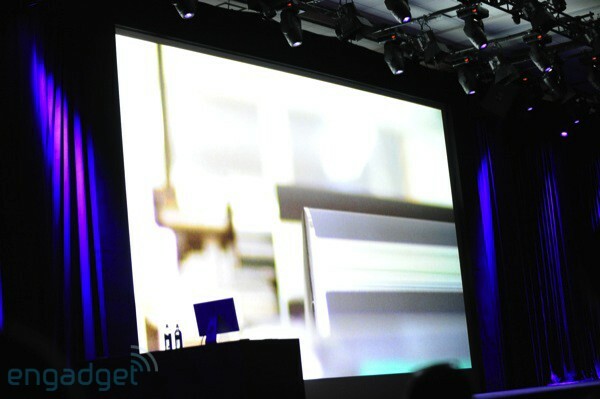 Hey, we're Engadget. 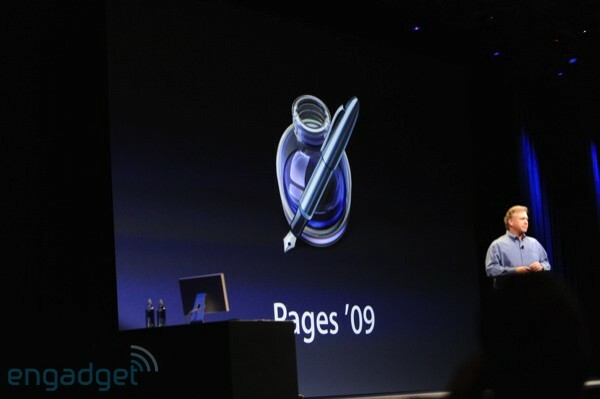 9:55AM "Next up, Pages." Next up, we're napping. 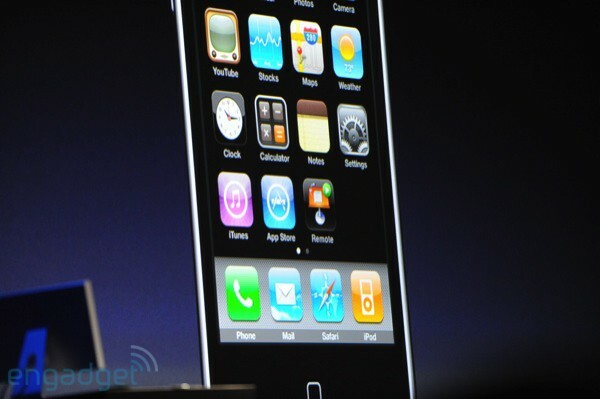 9:54AM "The new Keynote remote -- it's an app on your iPhone or touch, and it talk wirelessly to your Mac. If you have it set up in a vertical mode it shows your slide, and horizontal, it shows two, and you just flick your finger to move through." Huge applause! 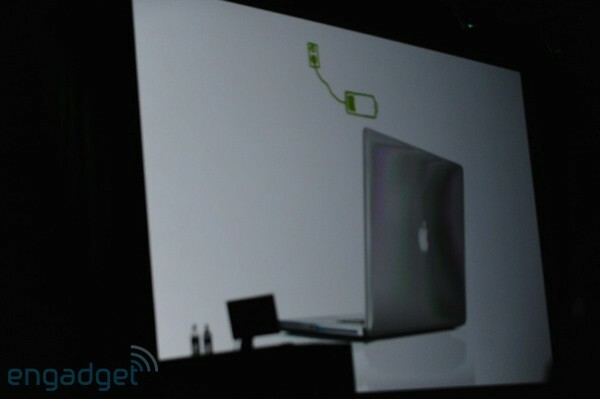 9:53AM He's showing off some of the chat effects we saw at the 'Spotlight on Notebooks' presser. The stone charts, wood charts in 3D. Very handsome. The boss-man will be blown away. 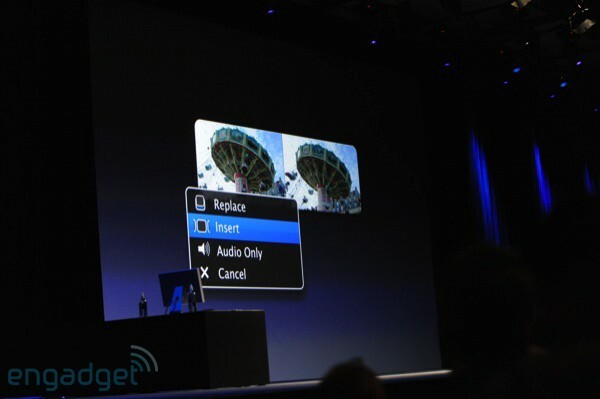 9:52AM There are some pretty slick Apple-commerical-like transitions for moving through images. "I like this one, it's called a Swing transition..." Obama! Ha! 9:50AM Phil is showing off how easy it is to make killer presentations. We don't know about you, but when we're delivering our presentation next week to the boss, this is going to seriously rule. 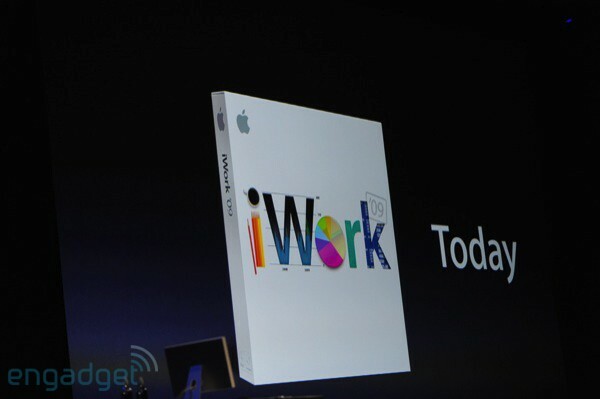 9:49AM "So number two... we have a completely new version of iWork." Oh boy. Wake us up when this is over. 9:49AM "So that's just a clip of 'artist lessons' -- it is so much fun. 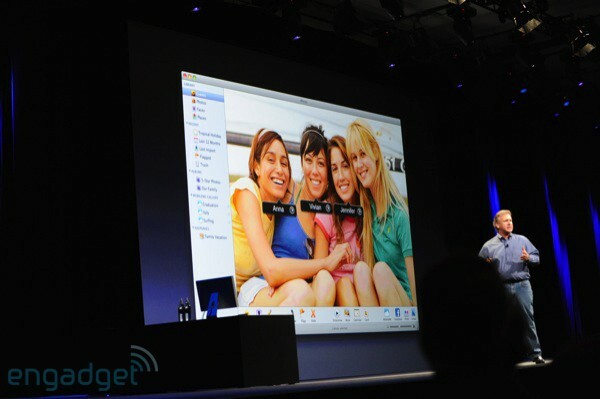 So those are three apps in the new iLife... so that's iLife 09." 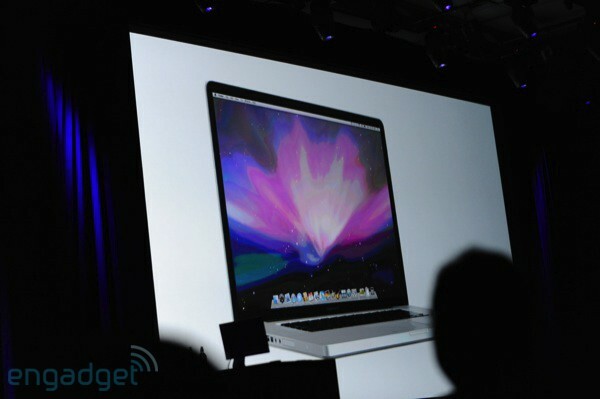 It'll be a $79 upgrade, family pack is $99, and it ships on all new Macs. 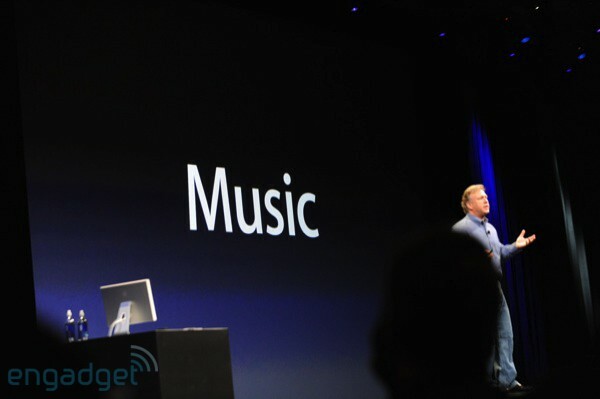 9:46AM A new Rock Band-like revenue stream for Apple. We're sure the shareholders are happy about that. Will be interesting to see if that catches on, though. 9:46AM "We continue to add more and more along the way -- they teach you their songs. So when you go in to GB 09, there's a section called learn to play. 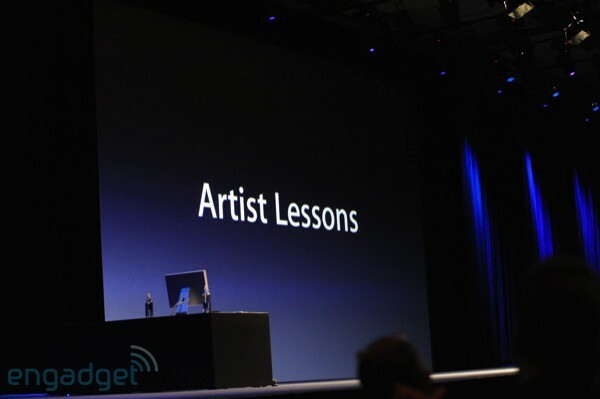 There's also a built-in store where you can download the artist lessons..." At $4.99 a lesson! 9:45AM "We bundle nine basic lessons for guitar and piano... but what's really cool is when you want to learn to play a song... we've enlisted artists to help you play... we call this artists lessons." 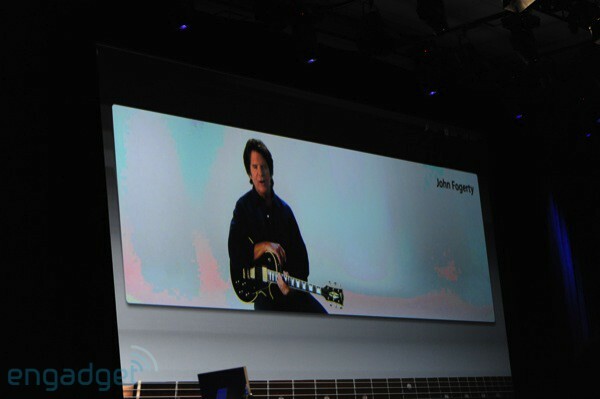 Oh man, John Fogerty! Ooh, the guy from Fallout Boy! 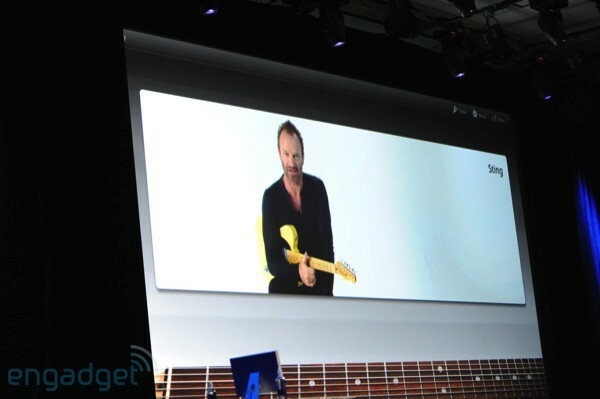 And Sting! Big applause, people love celebs. 9:44AM "Here's a snippet of that its like to learn something on a keyboard." More video. 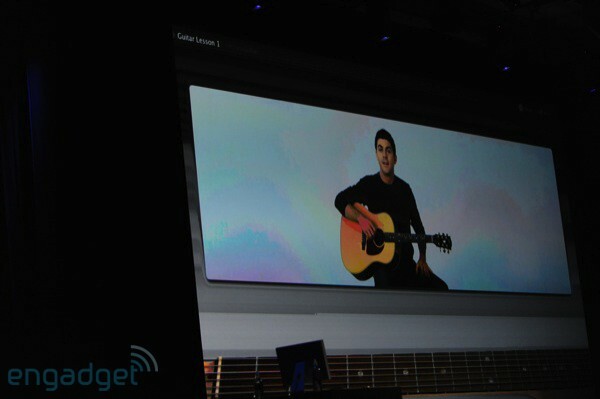 This is interesting, it's like the opposite of Rock Band. And way, way more mellow. 9:43AM "Let's play a snippet so you see what it's like." 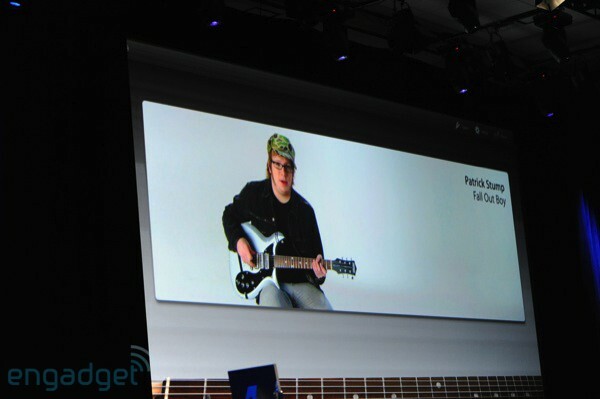 Video of an instructor (in HD of course) and the fretboard of a guitar along the bottom. The instructor is teaching blues chords. 9:42AM "I want to talk about one feature. 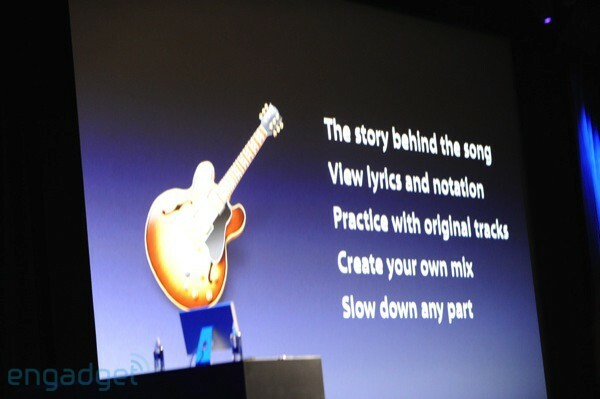 'Learn to play' there's a new user interface, and it teaches you how to play an instrument." 9:41AM "Isn't that impressive? 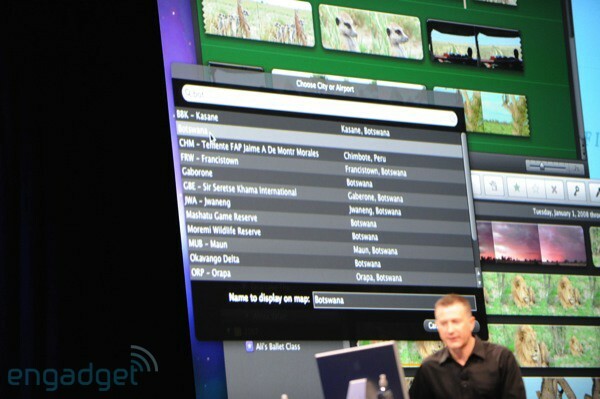 So that's just some of the features in iMovie 09... so that's the second app in iLife... 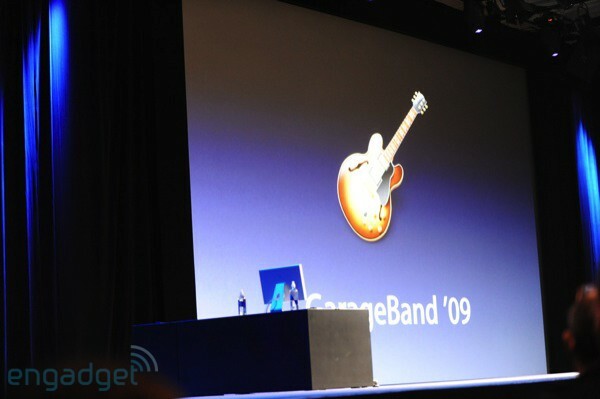 I'd like to talk to you about one more, the new GarageBand 09." 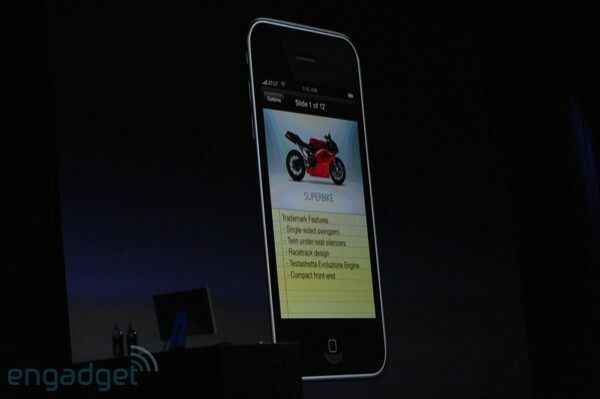 9:41AM "This is just a sub-set of features. Thanks very much." Big cheers. Phil is back! 9:40AM Big applause for that one. 9:40AM "Now let's look at themes." This is pretty intense, it's putting together some pretty complex 3D stuff, composite images, and flashy titles. 9:39AM "If I want to add a map to the video, I just grab and drag it into the movie... if we play this back, we get this really cool animated map from one location to another." Just like in movies -- prepare for an onslaught of abuse of this feature... coming soon! 9:38AM "Another great feature we have is video effects... cartoon, x-ray, aged film..." "If I play this back, it's been stabilized, slowed down, and aged film effect is applied... all in real time." Some applause at that. 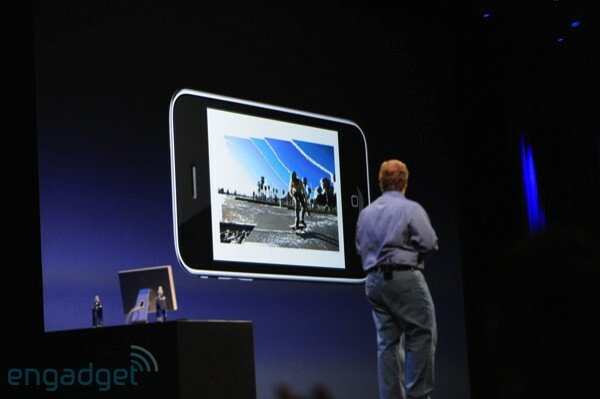 9:37AM Wow -- he just showed off image stabilization, and it's pretty impressive. 9:35AM He's going through pretty detailed descriptions of editing clips in iMovie 09 -- pretty tight technology, though not beyond what you might expect. 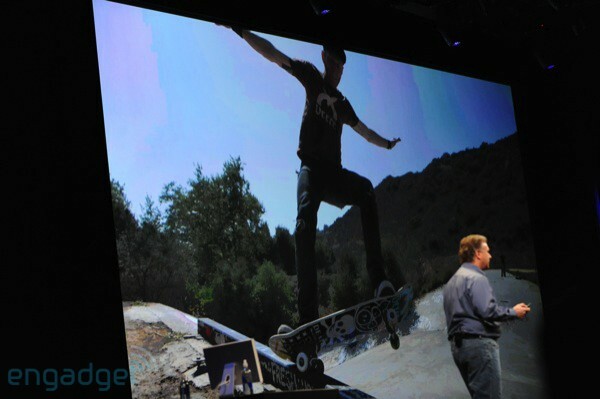 He's piecing together two clips of the same action so it's one quick cut. 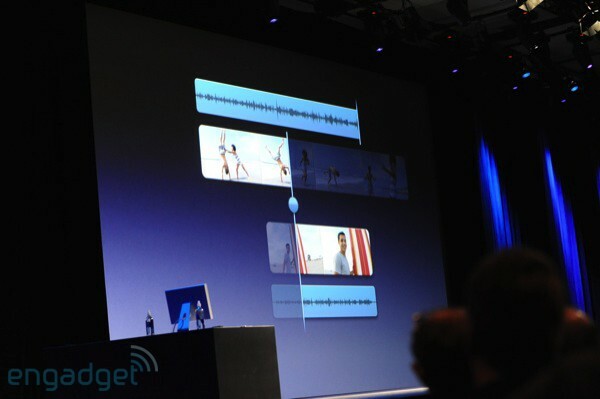 He's demonstrating how you can run audio from one clip over another really easily -- very slick implementation. 9:32AM "I like the dialogue, I can place this as audio only over top of our other clips." Just by dragging. 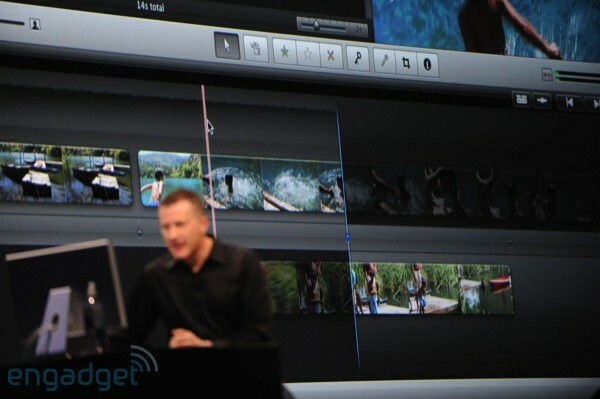 9:32AM "Let's jump in -- just like iMovie 08, we have great skimming... now if I want to put something in the middle of the clip, I just drag it." That's handy. Wow, he just showed a creepy, fake home movie clip with a kid. Kind of Shining-esque. 9:31AM "The right way to show this is with a demo... I've done something really special... I've asked our engineer to show this off -- Randy Ubillos." 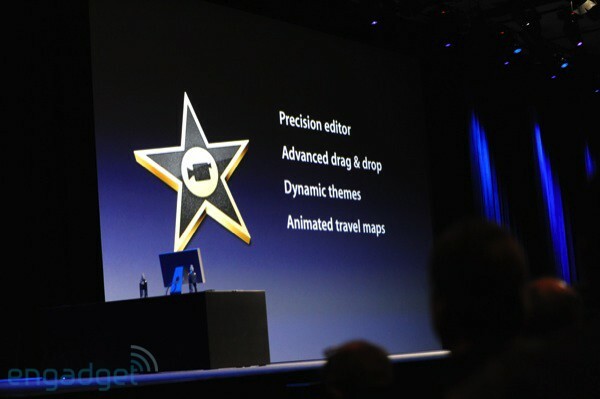 9:30AM "Context sensitive menus for clips, you can make new movies with dynamic themes: titles, transitions, effects..." "Animated travel maps -- you can create 2D and 3D maps to show where you've traveled... and now we have auto stabilization for shaky video." 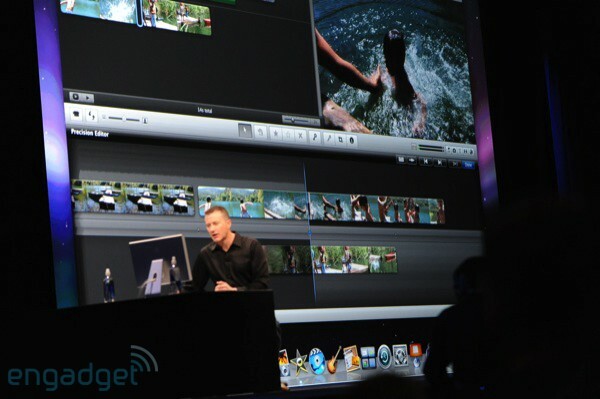 9:29AM "Last year it was all new, we had an amazing new way of editing. 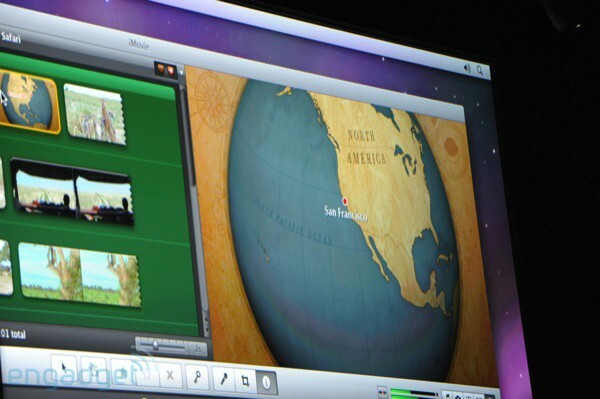 We did a whole new version of iMovie. 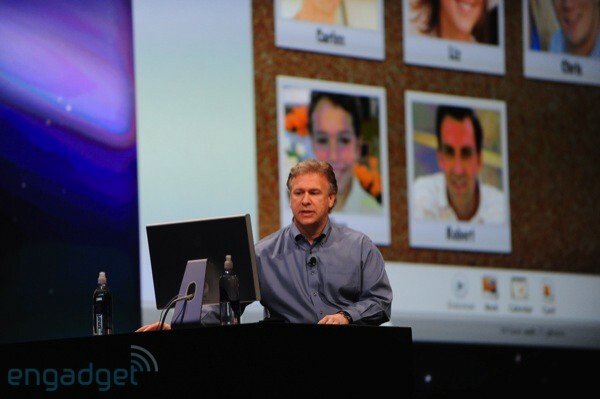 Not every feature was there for every customer... some people missed the features." 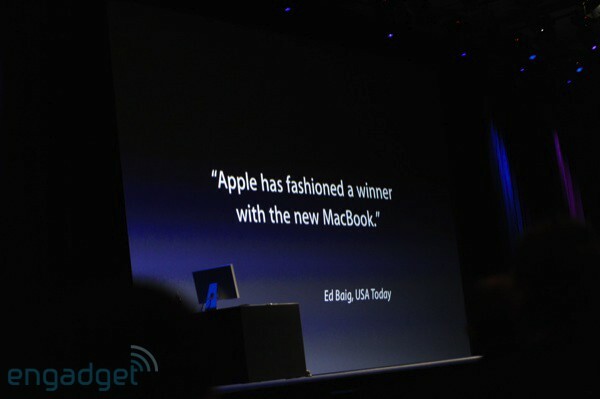 "In this new version, we think every customer will be blown away." 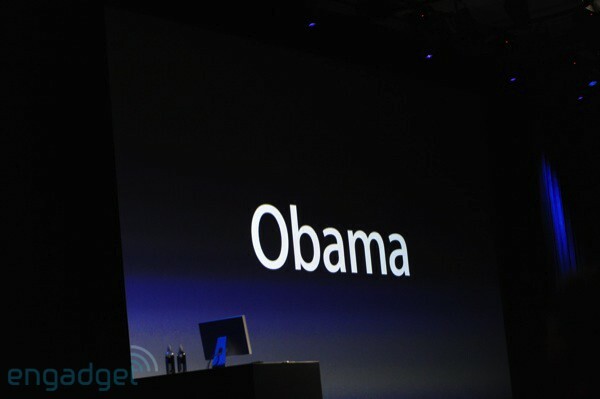 Wow, did he just admit that Apple did something wrong? 9:28AM "I hope you're as excited about this as I am." 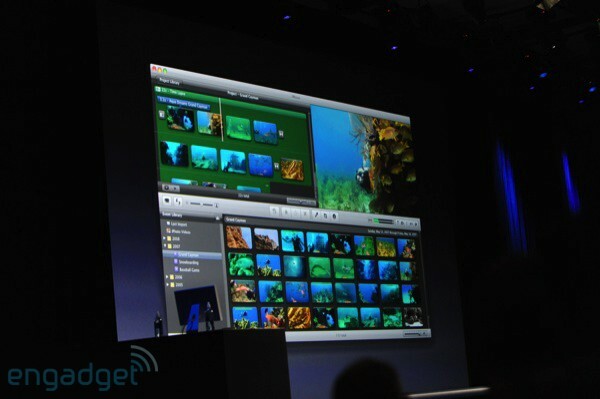 Well... "That's just the first of all the new products... we have a new version of iMovie." 9:27AM He's showing off ways of sorting your photo data. Which is incredibly boring. 9:27AM This tool would be great for stalking. You can really pinpoint where someone has been. Stalkers, take note -- your software has arrived. 9:26AM You can mouse over markers on a map and it will shuffle through photos from those locations. Pretty useful... if you like people or places. 9:25AM Now he's running through Places. He's working with photos taken in Aspen. "It's easy to find your photos and look at them." 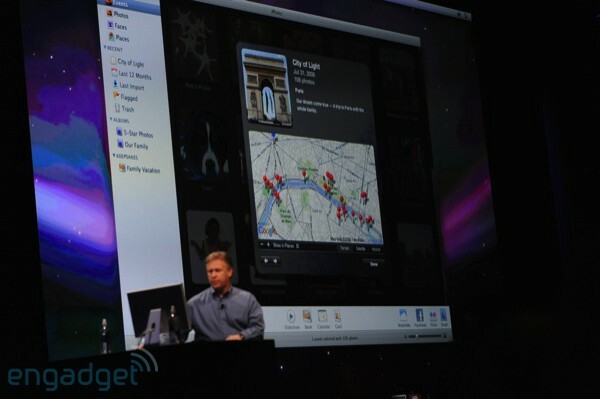 Now he's showing off how you can tag photos that haven't been geotagged. 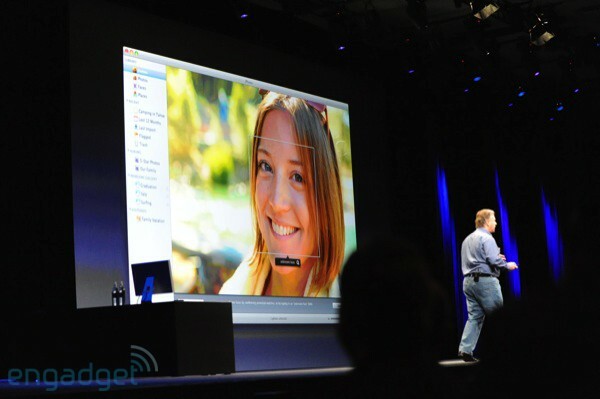 9:23AM Phil is demoing the face detection. Have you ever used Facebook photo tagging? Pretty much exactly the same. What's cool is that it finds the same face in other photos -- or at least guesses. 9:20AM Oh, actually demo time. 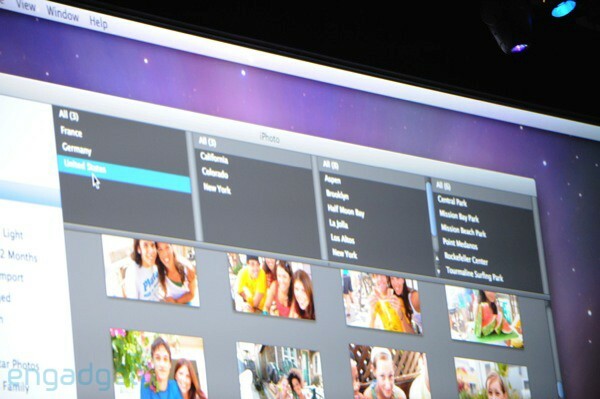 Phil is going to run through iPhoto. He seems intent on proving that it's "real." 9:20AM Travel Books: like travel books, but on your computer. 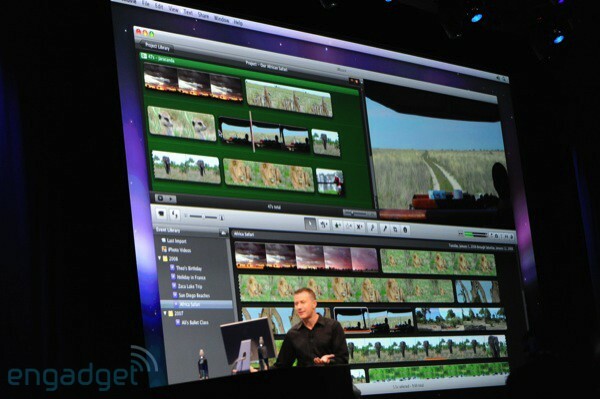 We love iPhoto and everything, but this is a bit dry. 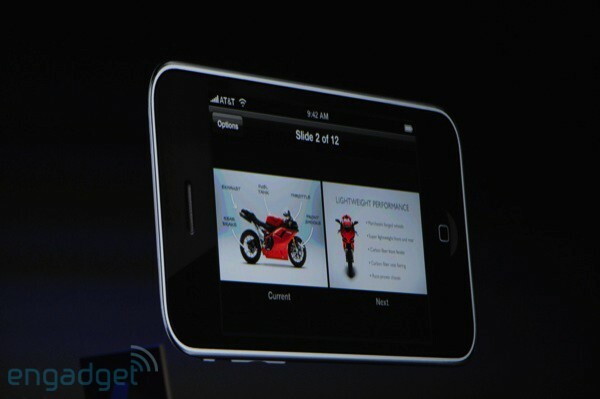 9:19AM You can show the same themed slideshows on the iPhone as well. The way it's breaking apart pictures and whipping them around is pretty nifty, we must say. 9:18AM Wow -- this is pretty cool -- pics are flipping in and out a la an iPod commercial. 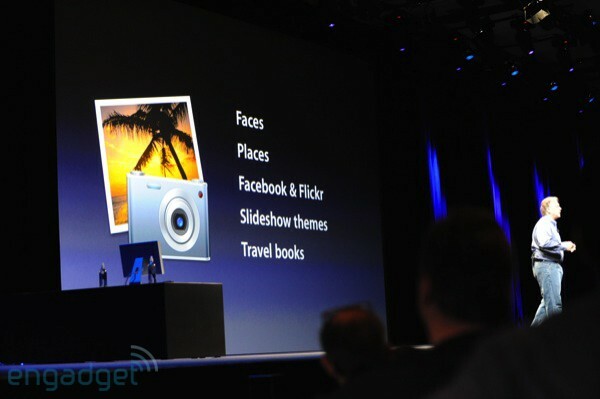 9:18AM "We use face detection to properly position pics in the slideshow." Applause. 9:18AM Phil's talking about slideshow themes. 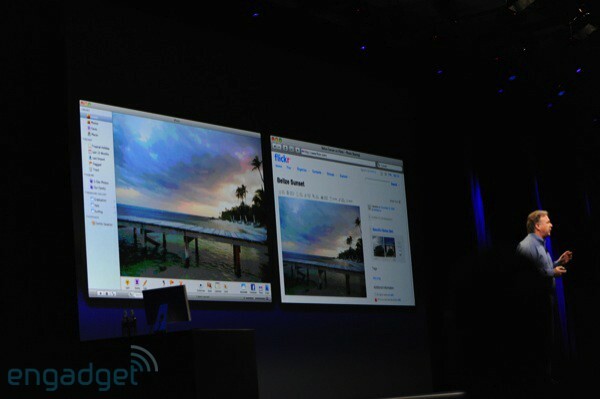 You can customize slideshows further, and there's a slew of built in themes. Demo! We're watching a little kid's ballet slideshow. This is charming. Peanuts music and everything. 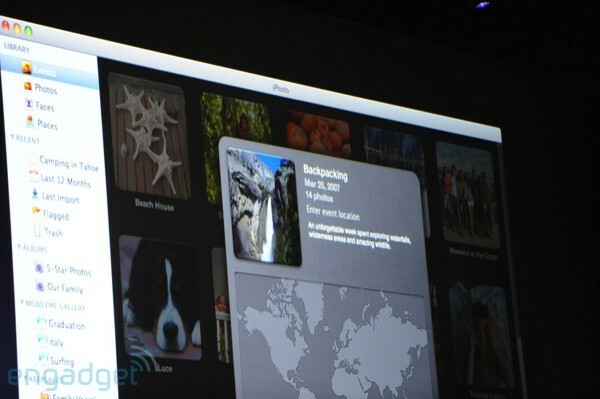 9:17AM "We've added a lot more depth -- we have support for Facebook and Flickr, that's built right in." Finally! 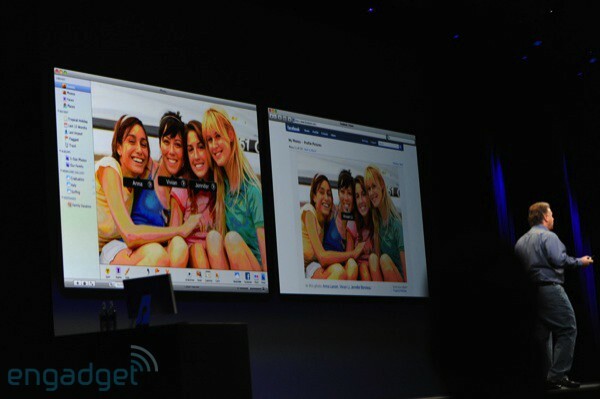 "If you have your Facebook account set up, it sends a photo to Facebook to share... your friends can tag people in photos, and it syncs to iPhoto." Big applause. "Flickr: there's a button built in -- Flickr also supports geotagging..."
9:15AM "The maps come from Google Maps..." It's like GMaps in iPhoto -- bizarre. 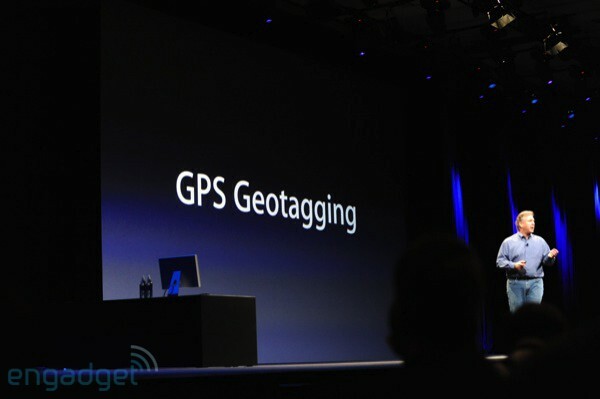 "In addition to street maps, we have satellite images..." Ah, you mean like in Google Maps? "So that's Places." 9:14AM "What if I don't have a GPS chip in my camera?" 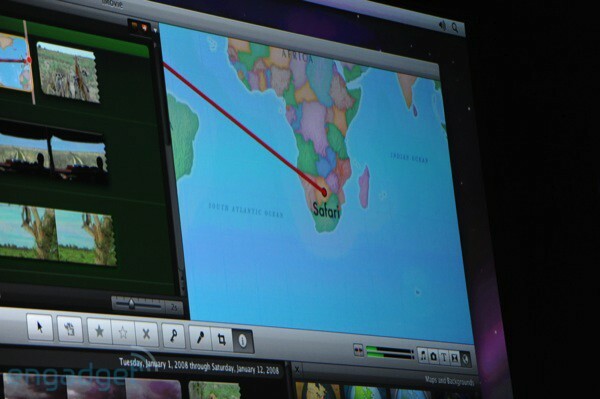 "There's a field that says 'enter event location' -- iPhoto has a database of thousands of locations. 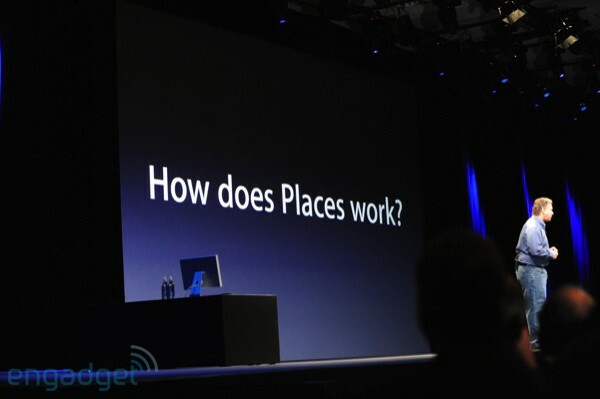 It assigns a geotag to all the locations in that event." 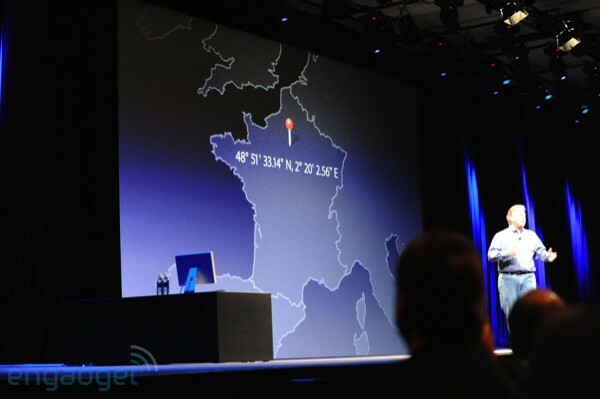 9:13AM Phil is demonstrating geotagging, Places will find human information about the lat / long of a photo -- say, the Eiffel Tower in Paris. 9:13AM "Places uses geotagging... new cameras like this Nikon, and the most advanced cellphone..." Flashes an iPhone -- the crowd likes that. 9:12AM "In addition to faces, we're adding Places. 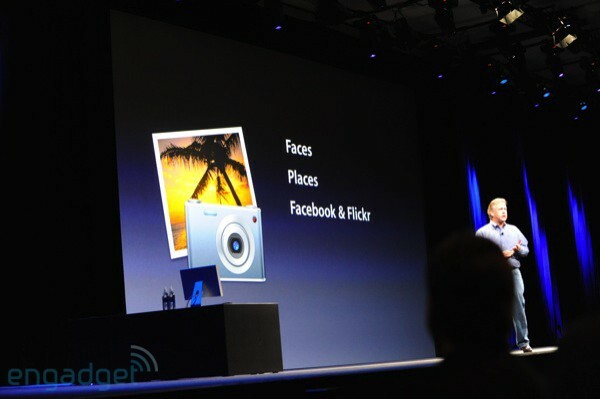 Wouldn't it be great if iPhoto could organize these photos around where they're taken?" 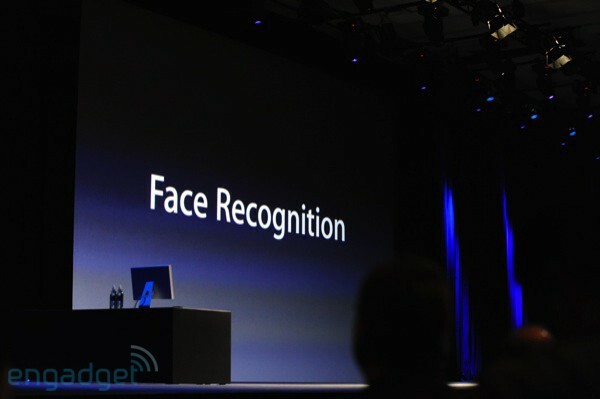 9:11AM "This is the best tech we've found for face detection, and it's easy to use -- I think you're going to love it." 9:11AM This is kind of cool. 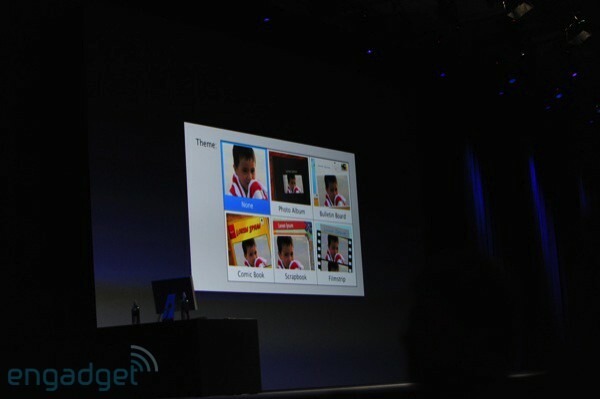 It can recognize the same person in different photos automatically. It asks you to confirm the guesses. That would be kind of handy. 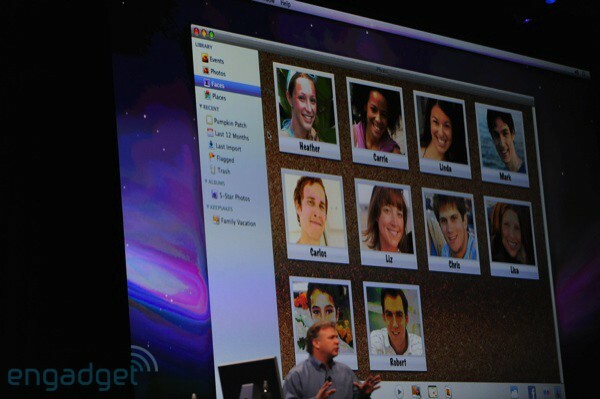 9:10AM The detection automatically find faces and you can tag them, like in Facebook. 9:10AM "Wouldn't it be great if you could organize photos by people? 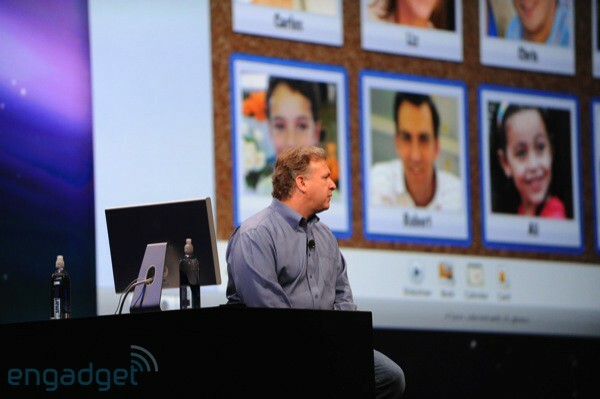 It's beautiful, you get a great new interface -- you wanna find their photos? Just go in and there's their picture." 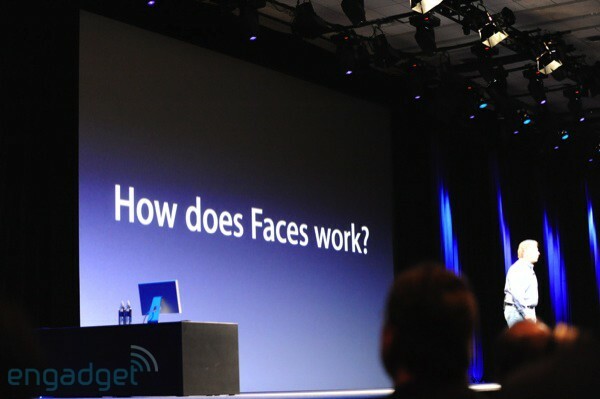 "It uses a technology called Face Detection." New? 9:09AM "What's in iLife? 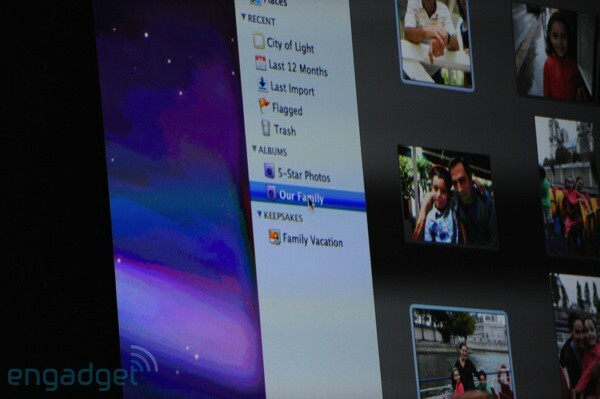 iPhoto 09." 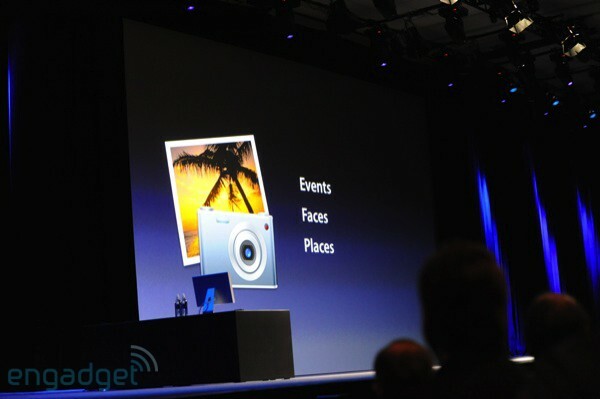 He's discussing "events" in iPhoto. 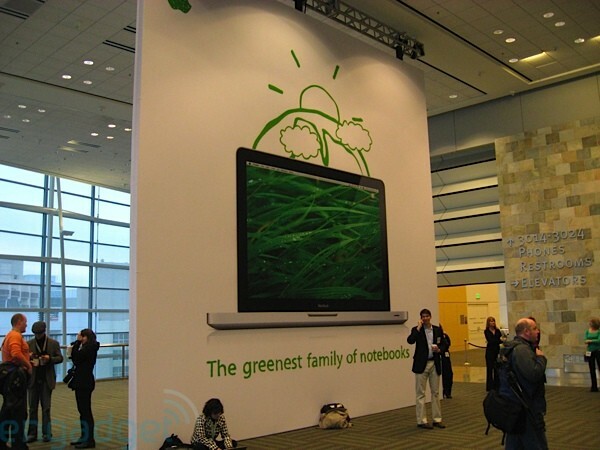 "It's turned out to be useful, and customers love it. This year we're adding two events in another way, one is called Faces." 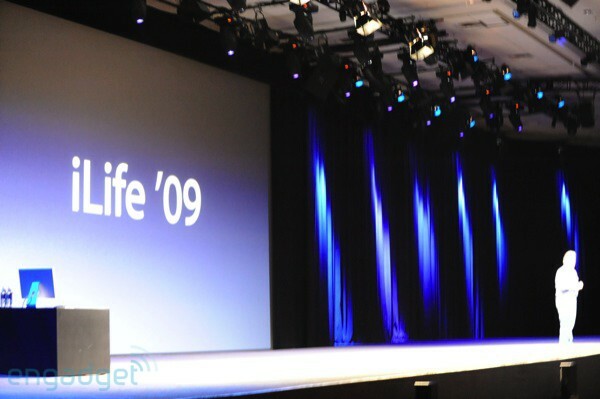 9:08AM "First, number one -- a new version of iLife... iLife 09." Can't say we're blown away. 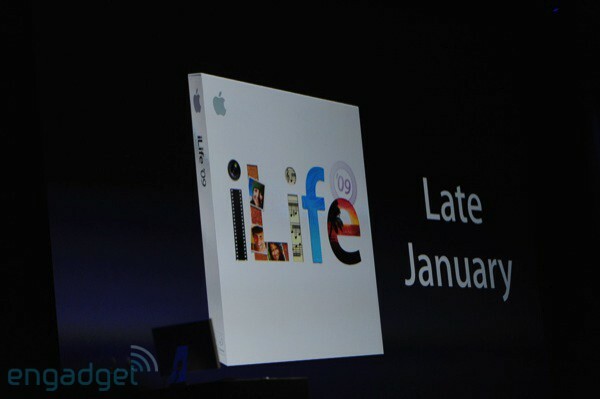 You're saying a NEW version of iLife? For 2009? 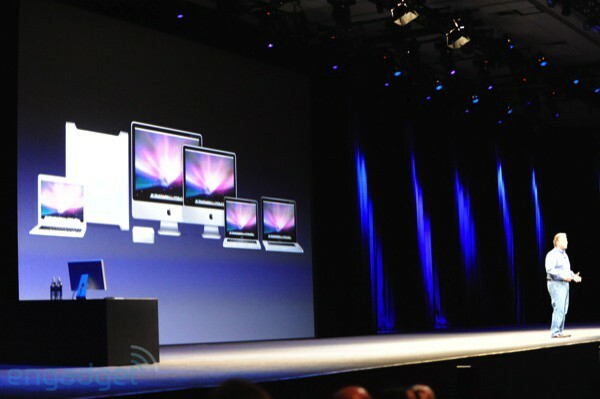 9:07AM "If you wanna hear some new things today -- I have three new things..."
9:07AM "The last year was our biggest ever, 9.7 mil Macs. 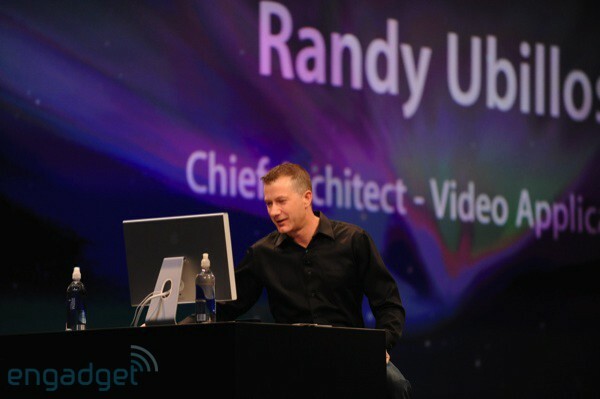 We did it by growing twice as fast as the rest of the industry." "The hardware THE leopard (!)..." 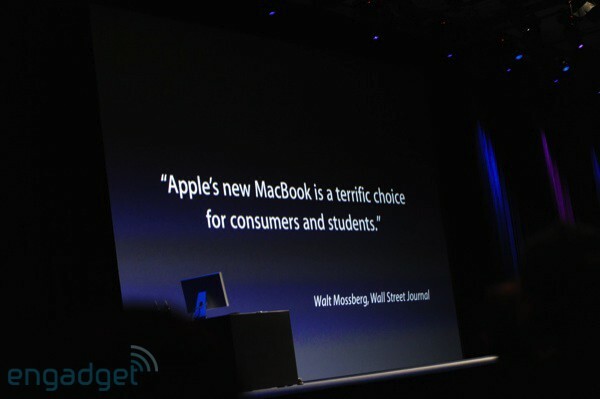 9:06AM "The Mac has had a resurgence with customers -- it's an important part of our business. 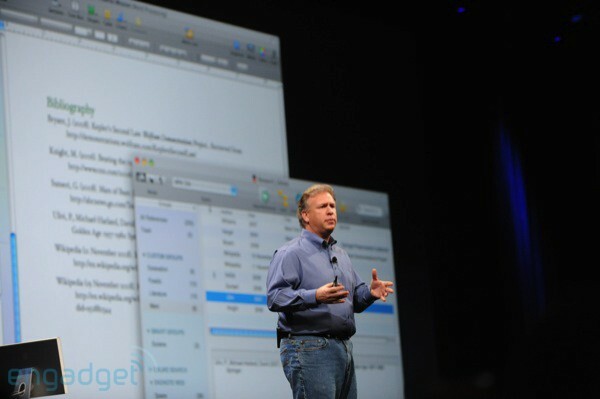 Today I'm going to talk all about the Mac." 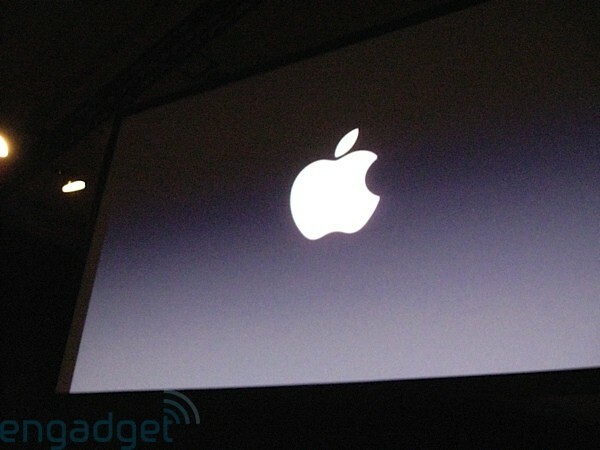 9:06AM "When I look at this photo, I couldn't imagine another company's logo there." 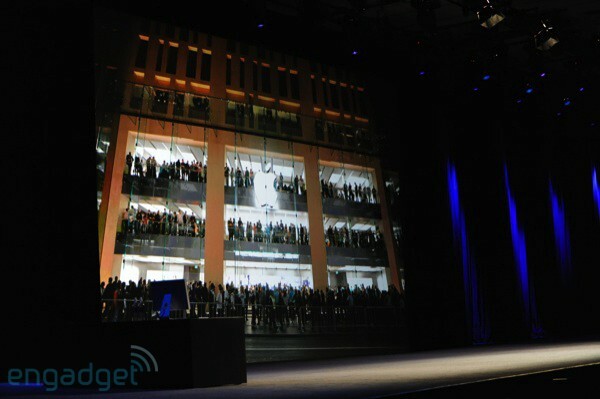 He propping the crews at Apple stores. 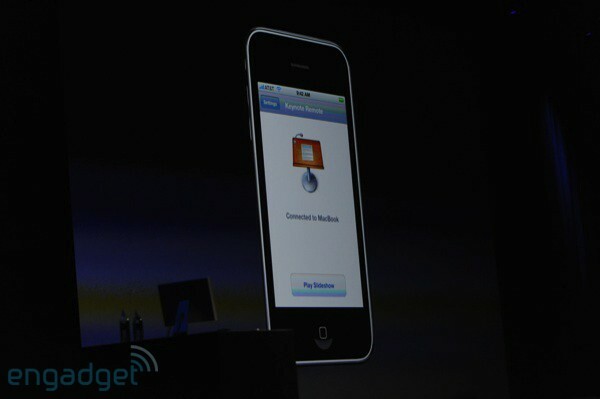 "3.4 million customers visit our stores every week." 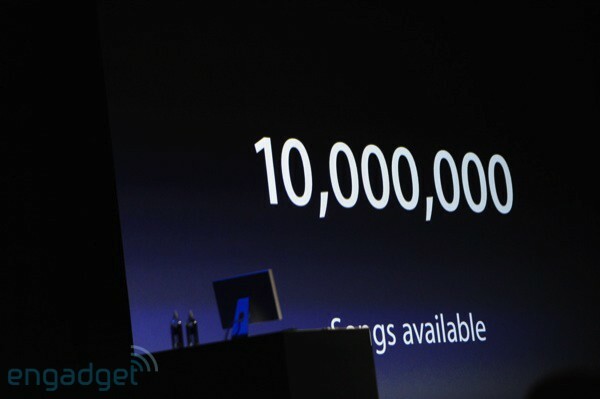 "That's 100 Macworld every week. So it's no wonder that what's happening is so important to us." 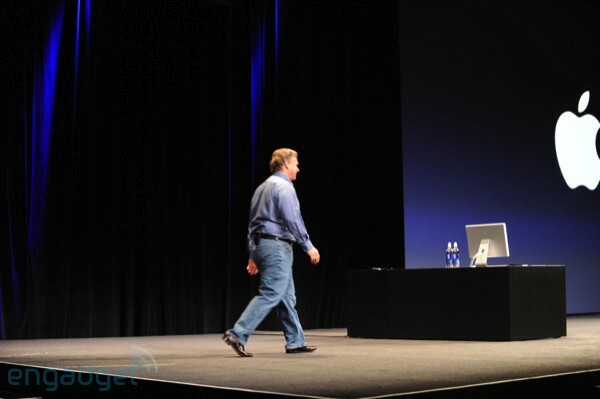 9:05AM "This is an exciting time at Apple. You can feel it no where better than in all these stores around the world. Here's our store in China, Germany." Smattering of claps. "Just look at the crowds of people lining up." 9:04AM "Good morning. 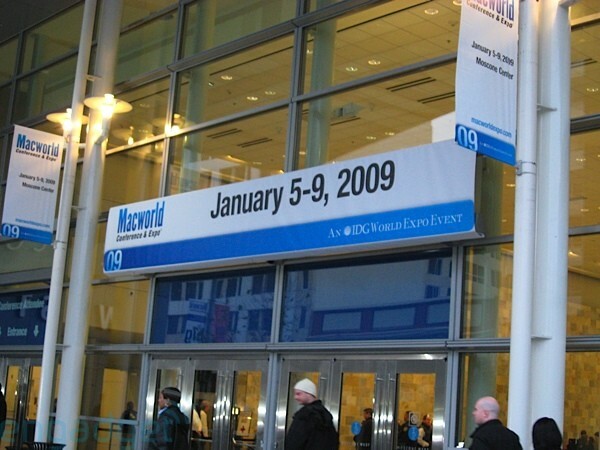 I'm so excited to deliver the Macworld 09 keynote. I'm so glad you all showed up." Laughs "Thank you so much." Big cheers. 9:04AM Big round of applause -- very supportive crowd here. 9:03AM And the lights are down! 9:01AM We're not going to lie -- this Coldplay is really loud. 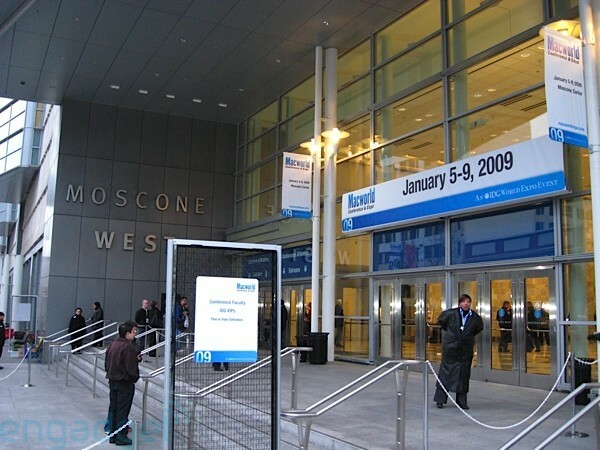 8:59AM "Good morning ladies and gentlemen -- welcome to Macworld 2009. Silence cellphones." Or we'll kill you. 8:58AM Sweet, some Beck. 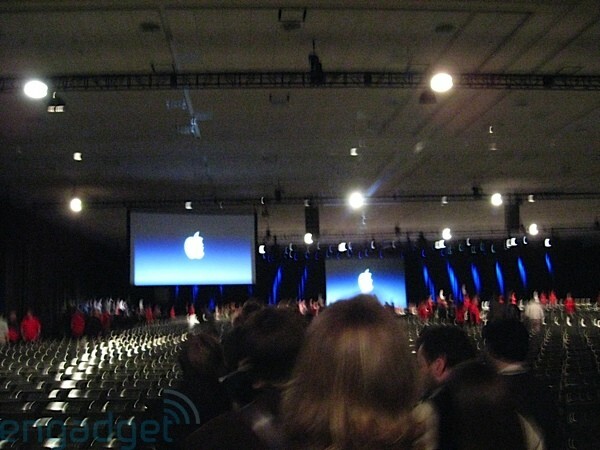 The hall is pretty packed right now, but people are still milling around. We're expecting to see a lot of scrambling when the lights go down. 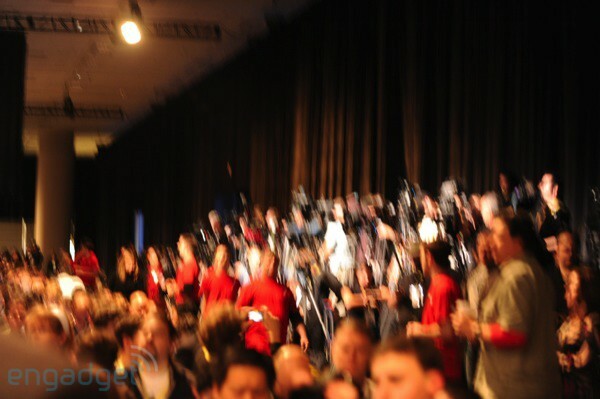 8:56AM We're camped out in front of the show floor as well, here's a shot of Apple employees streaming in. 8:49AM If you're wondering about the blurriness of that photo, we were basically in a gallup to get to our seats. It's quite the mad dash. 8:45AM We're inside and sitting! MGMT is blasting over the system here, and people are seriously knocking each other over. To say there's some excitement is an understatement. 8:39AM We just met up with Ryan Block (you may have heard of him) and Veronica belmont -- we're all parked at the garage door waiting for the festivities to begin. Still waiting. Did we mention we're waiting? 8:22AM Time to elbow our way towards the door... watch out faces! 8:18AM Also, keep in mind our timestamps will be in PT, since we're all cold-chilling in San Francisco. 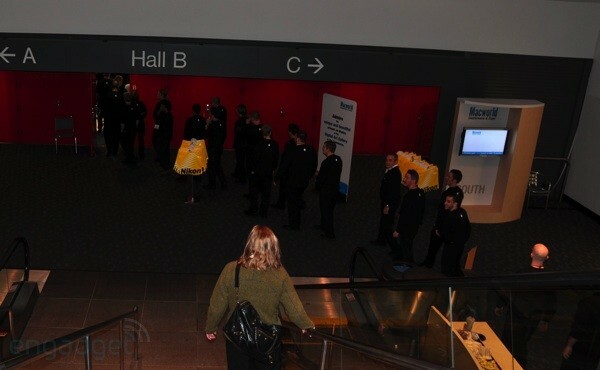 We're on the floor of Moscone West waiting to get into our seats, we'll keep you posted minute to minute as it goes! Hang tight. 8:17AM From this point on, our updates will be at the top of the post -- so look lively!